Single-use technology (SUT) products are widely accepted for the manufacturing of vaccines and biologics. The increase in adoption of single-use Thermo Scientific™ BioProcess Containers (BPCs) is a result of their demonstrated performance, and their cost- and timesaving benefits. The quality and purity of the plastics used to produce Thermo Scientific™ Single-Use Bioreactor (S.U.B. ), Single-Use Mixer (S.U.M. ), and Single-Use Fermentor (S.U.F.) 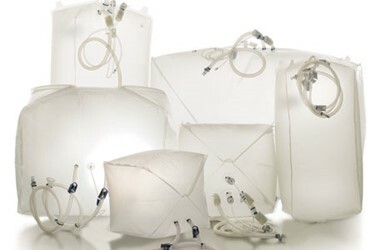 BPCs and storage bags are crucial to the purity and efficacy of final biopharmaceutical drug products. Several characteristics are important to the performance of BPCs, including biological compatibility, physical and mechanical properties, and extractables and leachables (E&L). This paper details some of the important characteristics of the plastic films used to manufacture BPCs, with a discussion on E&L and Thermo Fisher Scientific’s strategy for characterizing the extractables profiles of our BPC films. SUT products used in biologics and vaccine manufacturing provide many advantages, including fewer cleaning and sterilization processes, reduced cross-contamination risks, and shorter setup times. The advantages offered by SUT products are accompanied by regulatory requirements that focus on the suitability of SUT containers or systems. These requirements focus on the interactions between the containers and the liquids held in them. Since biologics producers use SUT products in upstream (mixing, cell culture, fermentation, and harvest/collection) and downstream (purification, bulk drug storage and transport, and fill-finish) operations, the need to fully characterize BPC products has never been greater. The end users of SUT systems rely on their suppliers’ choice of materials of construction, which, for the purposes of this discussion, are limited to the plastic films used in the production of BPCs for S.U.M.s, S.U.B.s, and S.U.F.s. The choice of film, and the processes and environments in which the film is converted into BPCs, shape the mechanical, physical, chemical, and biological characteristics of the film. For these reasons, the end user’s choice of film is arguably the most important decision to be made when choosing SUT products and suppliers.